LESS FAT - ¼ Less Fat than Shredded Low-Moisture Mozzarella Cheese. Fat reduced from 7g to 4g per serving. 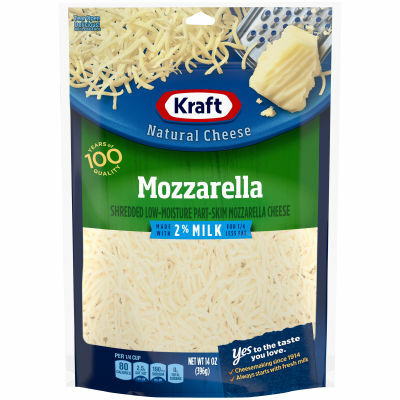 Enjoy Kraft Mozzarella 2% Milk Shredded Natural Cheese! For your convenience, this delicious cheese has been pre-shredded so that it’s ready to be added to your favorite dish, and this resealable 14oz pouch ensures that your cheese will be fresh every time. Always made from fresh milk, Kraft shredded natural cheese is perfect for your family’s favorite pasta, enchiladas, garlic bread, salads, and more. You can even eat it as is as a satisfying snack! For over 100 years, Kraft has been making the cheese your family loves. So, no matter how you like it, we’ve got a cheese for you.